FOREST HILL is a neighbourhood and former village in Toronto, located north of St Clair Avenue between Bathurst St and Avenue Road. The village was amalgamated into Toronto in 1967 and the area has retained its name as a neighbourhood. [ Forest Hill Map ] Forest Hill North extends from Briar Hill Avenue in the north to Eglinton Avenue West in the south, and from Latimer Avenue in the east to Allen Road and Marlee Avenue in the north-west and south-west, respectively. 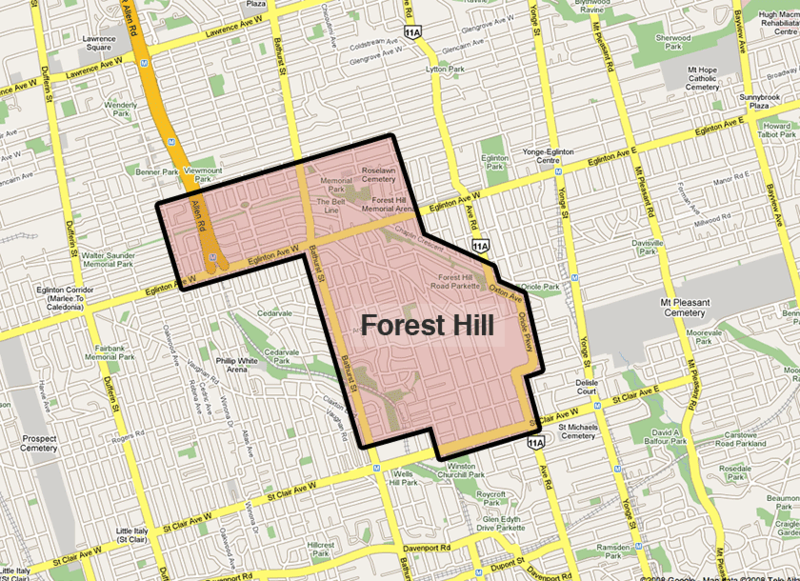 For administrative purposes, Forest Hill North is Toronto neighbourhood #102. Forest Hill South is directly south of Forest Hill North. It extends from Eglinton Ave West in the north to Tichester Road in the south, and from Bathurst Street in the west to Elmsthorpe Road in the northeast and Avenue Road and the Oriole Parkway in the east. There is an additional stretch of Forest Hill South between Bathurst Street and Spadina Road, north of Lonsdale Road. If you are interested in buying, selling or renting a home in Forest Hill, please feel free to call me or send an email for detailed information.